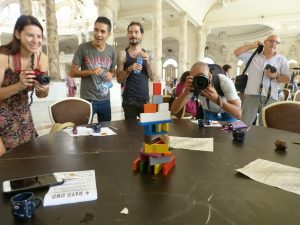 Two journeys through Cuba, the Rebirth Forum, a question, the collective El Puente: let’s find out what are the pieces of the puzzle composing this ludic activity of social analysis which is much more than a mere pastime. Juan Sandoval, director of Cittadellarte’s Art Office as well as co-author of the game, tells us about its peculiarities. 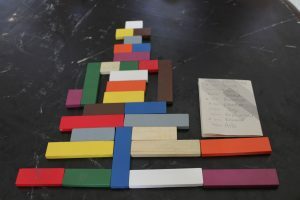 Ten coloured tiles, a spinning top, a question: these are the key elements of the new game “(d)estructura”, conceived by the collective El puente_lab (artists Juan Esteban Sandoval and Alejandro Vásquez Salinas) and Mariangela Aponte Núñez. It’s not a mere game, but an alternative instrument to observe and analyse the social relationships of a community, gathering data in the context of a specific project. 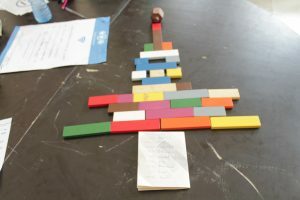 The table game starts with a question asked to all participants, whose answer emerges through a process in stages studded with reflections, colours and dialogue among the players. What might only look like a pastime is in fact the activator of a micro cosmos, the mirror of a micro community. “How do you see yourself in 10 years time and what do you need to achieve this idea of yourself in the future?”: starting from this reflection, the participants (divided in groups of 5/6 people) must try and identify ten characteristics or requirements they consider fundamental for the issue. The first glimpse of micro society reveals itself in the exchanges among the players, who have to agree on the ten words and key definitions to choose. 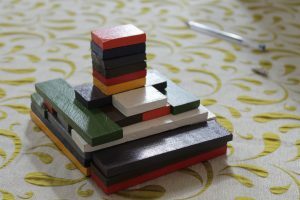 Once the concepts have been identified, the participants take turn in “erecting” their metaphorical building using the tiles. 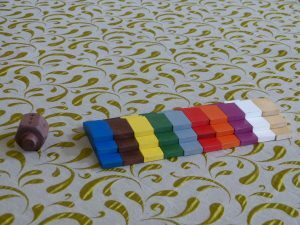 With the help of the spinning top, each of them can add, remove or replace one or more tiles, which are of three different sizes (representing three scales of importance). That’s the start of a turbillon of passages leading to the completion of the structure, within a set amount of time. Players seem therefore to conceive, design and build their future, taking into consideration the needs of the group, since the structure is realized with the other players. The results are then analysed: first and foremost the arrangements of the tiles, which would have different forms and designs (e.g. more or less stable) depending on the group. 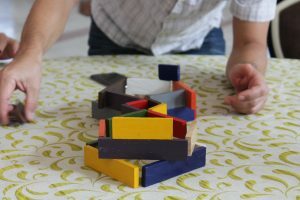 You eventually get to the final passage, giving the game its name: “(de)structura”, in fact decomposing the structure. Starting from the tile positioned last to the first, you can notice the scale of values attributed to every single concept, a process inspired to Maslow’s pyramid. The game has been created by the Colombian collective El puente_lab (Juan Esteban Sandoval – director of Cittadellarte’s Art Office – and Alejandro Vásquez Salinas) and curated by Laura Salas Redondo, Erick González León and Cecilia Guida, with the support of Cuba’s Rebirth/Third Paradise working site and the collaboration of Wendy Peñalver Sánchez, and of LASA (Laboratorio Artístico de San Agustín) in the persons of Candelario and Aurélie Sampeur and the collaboration of Wendy Zuferri. 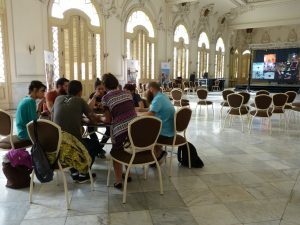 “In September 2016,” – explains Juan Sandoval – “we presented our game (d)estructura to our Cuban partners for the first time, and specifically to the curators of the Rebirth working site in Havana and of the LASA centre. At the beginning there was a test phase, in which we tried out the dynamics of the game for a couple of weeks. Then in November we started a journey through the Cuban central regions to play with people. 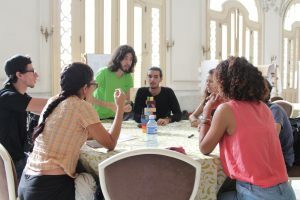 We’d stay in an area for two to three days, relying on a local mediator who would help us create contacts and organize the sessions acting like a spokesperson between the groups”. Still in November 2017 el puente_lab created continuity with a new journey, this time travelling to the areas east of Havana. “Our intention” – carries on the director of Cittadellarte’s Art Office – was to visit a different context to the big city we had approached the year before, to find out the peculiarities of the different contexts. We acknowledged a behavioural change between the two geographical areas: this time people were more suspicious towards us. Once the activity had started though, the participants were always satisfied”. Juan said that the journeys were the most important part of the project, because necessary in order to draft a social cartography. Sandoval has clear ideas about the future of the game. 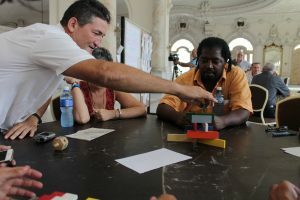 He is going to increase the production of the pieces of the game for the next Cuban Rebirth Forum, so that (de)structura can spread as much as possible through a distribution to the partners. In order to reach a more and more diverse and wide target there’s also a book in course of production, which is due out next summer and will be presented at the next Cuban Forum. The volume will explain the rules and the meaning of the game, and will tell the story of the journeys through the Cuban regions. “We think that our game is a useful instrument to research groups of people within a wider project.” – concludes Juan Sandoval – “The activity itself doesn’t bring any result, but it is a way to gather information. The game has in this sense exceeded our expectations. By playing it, we have realized it has a wide scope and that it can be a useful tool as part of a methodology”. The future of the game also speaks Italian: the project is going to be extended to our country, and something is actually already in place. In Cossato, a town in the province of Biella, (d)estructura will be the research tool to investigate and identify possible solutions for the requalification of a communal area.